SCMS Water Institute was formed in 2010 in order to address the water related environmental problems affecting the society. Since water is one of the most important resource limitations of the century, it was the commitment from the SCMS Group of Educational Institutions to establish a research and consultancy centre on water for its effective management and sustainable development. 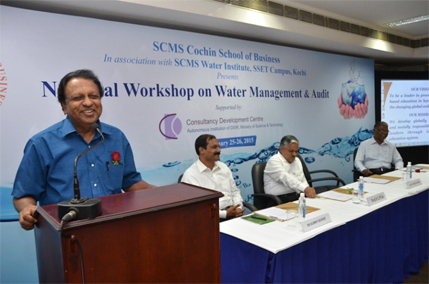 The institute was initially named as Centre for Sustainable Water Technology & Management (CSWTM) which got renamed to SCMS Water Institute (SWI) in 2014. To become a globally recognized resource centre on water with a focus on knowledge creation and transfer to address multifarious needs and challenges faced by India. To address the water related issues through multidisciplinary efforts in order to achieve a sustainable and secure water future. SCMS Water Institute accomplishes its mission through research and development, technology incubation and application, education and training, demand driven consultancy and networking. Water audit at the city scale allow Corporation to understand the potential sources, the ward wise and sector wise demand for water and the spatial variation of scarcity in the corporation area. SWI collected and analyzed the secondary and primary data collected in this study to develop the water balance for the city and using GIS platform mapped the water stress in the area for the present conditions and for various scenarios in future. VISUAL MODFLOW simulations were carried out to assess present status of salinity intrusion in Cochin. A forecast of salinity intrusion in the study area for next decade was also assessed for various scenarios. 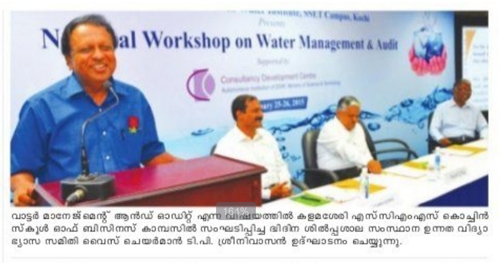 Kerala Water Authority ( KWA) is the main source of water supply in Kochi. The existing water distribution network of KWA is analyzed for the first time using EPANET. An assessment of the network for its sufficiency to meet future demand is carried out and recommendations are made for improvement.. Though about 200 MLD water is supplied by Kerala Water Authority to Kochi Corporation area, the actual quantity received at the end is much lesser due to losses in the distribution line, popularly known as non revenue water (NRW). So far there is very limited understanding on the quantity of NRW in the area. SWI conducted detailed investigations to understand the amount of NRW within a DMA in Kochi corporation area in collaboration with Kerala Water Authority. SWI in association with Koratty Panchayat has collected water from 190 drinking water sources like domestic and public wells and analyzed for various water quality parameters as per Bureau of Indian Standards. All the water sources were later documented using geographic Information system (GIS) to prepare a water quality atlas. It was found from the results of analysis that 90% of the drinking water sources were contaminated by Coliform bacteria. Another significant observation was the presence of high acidity, Iron and Fluoride in certain wells. Remedial measures were advised and the Panchayat has adopted necessary measures promptly. This water quality atlas will be extremely useful for the water related planning process in view of decentralized planning process of Koratty Panchayat. The atlas is prepared such that it can be updated in every six month. Automated bio monitoring using the LimCo biosensors is the assessment of water quality using miniature aquatic organisms with the help of impedence spectroscopy. As per the MoU of SWI with LimCo, this instrument and the concept of impedence spectroscopy will be introduced to the Indian conditions for analyzing water quality in rivers, aqua culture fields and water treatment plants. The project aims at the utilisation of the unused but abundantly available backwater source to quench the thirst of Kochi. 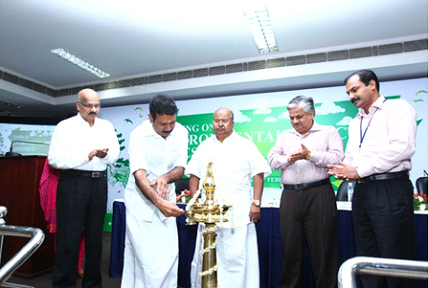 The scope of the present study is on the fate of pesticides and heavy metal contaminants, which are found in the backwaters, along with an economic desalination of the brackish water from backwaters of Kochi through the method of Electrodialysis. Project aims to study the existing algorithms to retrieve salinity through satellite remote sensing. The study will establish a relationship between the salinity and Coloured Dissolved Organic Matter (CDOM) in the estuary and CDOM will be used as a surrogate for satellite mapping of seasonal salinity fluctuations in the Cochin Estuary. The objective of the project is to detect and identify filamentous bacteria which are responsible for the foam in aerobic effluent treatment process. Their remediation by Bacteriophage method will be explored. SCMS Water Institute (SWI) has entered into a Memorandum of Understanding with University of Applied Sciences, Ravensburg-Weingarten in order to develop SWI into a ‘Centre for Excellence in water’ within the coming few years. A project named “Establishment of a Centre of Competence on Water and Waste Water” has been sanctioned by Württemberg-Stiftung, Stuttgart, Germany for this purpose. Joined research on different mechanisms on membrane separation named Low Energy Electro dialysis, Forward Osmosis, Effluent Water Treatment etc. Strengthening of the M. Tech Environmental Engineering course being started at SSET. As part of this project a training programme on Membrane Technology was organized for staff and students of SSET at the University of Applied Sciences, Ravensburg- Weingarten. Initiatives for joint research on electrodialysis have been started with the institutional partnership from German Industry Partner Dr Hans – Jurgen Rapp, DEUKUM, Frickenhausen, Germany (www.deukum.de). The Baden Württemberg Foundation is funding the exchange of staff and students in both directions between the SCMS School of Engineering and Technology and the University of Applied Sciences Ravensburg-Weingarten. SWI cooperates with the companies of the Indian section of the German Water Partnership. 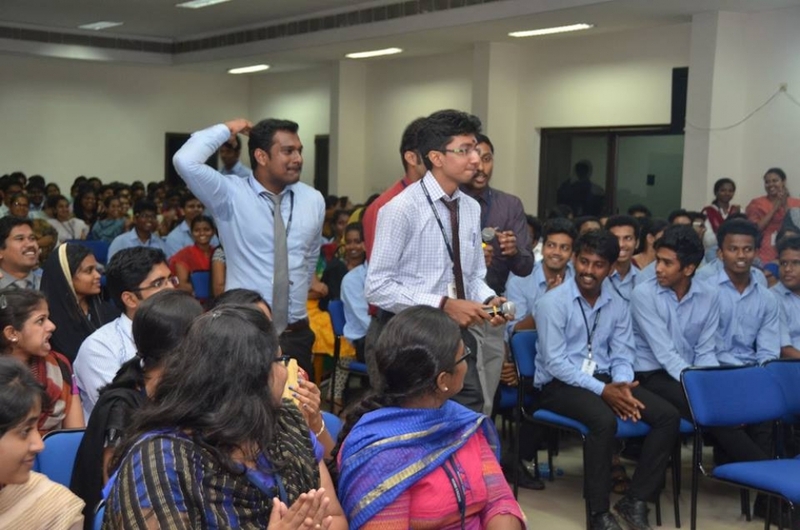 SWI organized the 2nd Indian GWP day “German Solutions to Indian Challenges” on 6th October 2014 and hosted it in Cochin and partly on the SSET campus. Dr. 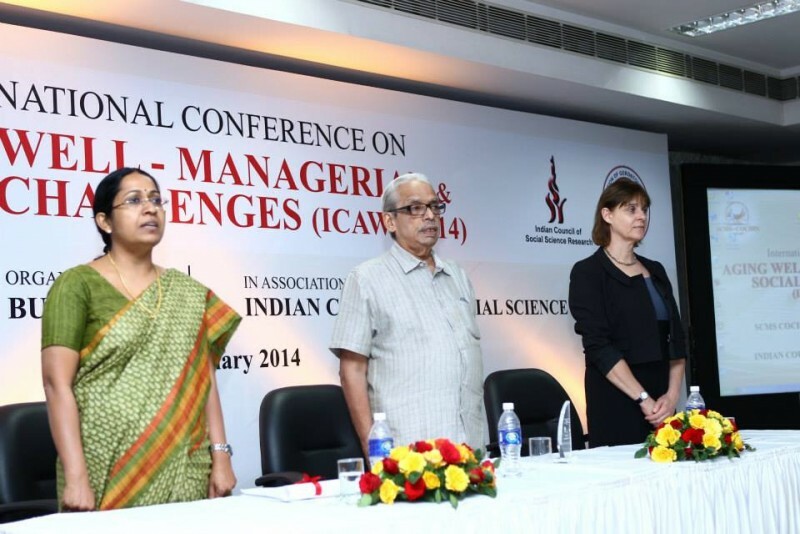 Sunny George, a limnologist of international repute is the Director of the SCMS Water Institute. He has special expertise in standardizing and fine turning several laboratory level concepts and ideas and converts them into socially relevant projects and programmes. Dr. 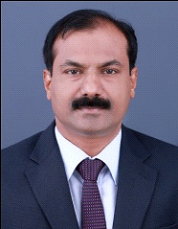 Sunny George has been awarded fellowships by the Council of Scientific & Industrial Research (CSIR) New Delhi, Belgian Royal Institute of Natural Science, Brussels, Belgium, United Nations University, Tokyo and the United States Department of State, Washington D.C. 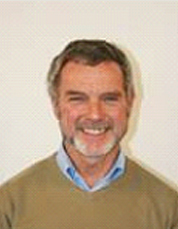 He has more than 20 years of experience in research, consultancy and implementation of development projects and has worked in several European Universities and Institutes. 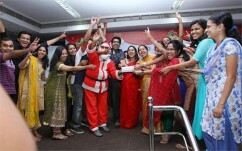 In 2012 he was selected by the U.S Government as a member of Indian Water Mission to United States. SWI gave both theoretical and hands-on training on point recharging of wells to 30 participants of Koratty panchayat. They were grouped into a “Water Brigade” by the panchayat. These trainees are capable of disseminating the idea of roof top rainwater harvesting to the interested persons in the panchayat. 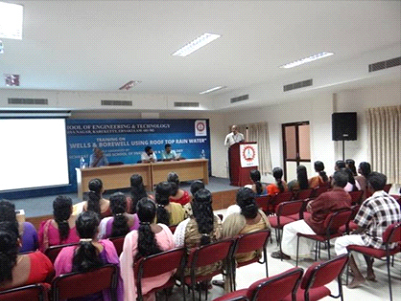 SWI provided training on water quality analysis to 15 women selected by the panchayat. These women are now in a position to analyze six basic drinking water quality parameters. They are expected to carry out the analysis of water from the drinking water sources within the panchayat at periodic intervals. 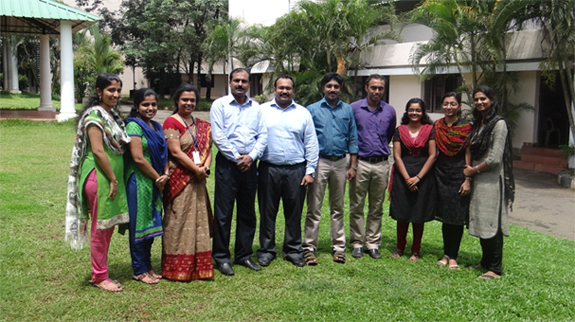 SWI and Environmental Engineeirng in association with Cochin Municipal Corporation organized a two day training programme on Environmental Impact Assessments (EIA) for small project during 21- 22 February, 2014 at SCMS Cochin School of Business, first of its kind in the state. A total of 74 participants from various section of the society including charted accountants, high court advocates, university professors, NGOs, students etc participated in this event. The training covered assessment of positive and negative environmental impacts of every developmental projects and formulation of technically and economically feasible mitigation measures. A systematic training module for conducting EIA was developed by SWI and EE. This training module is in the process of getting published as a standard manual for conducting EIA of small projects.